Crazy Horse 1/1200th scale Bronze. A numbered bronze of Korczak's 1/1200th scale model for the Crazy Horse Memorial® Mountain carving is available to special friends of the Memorial. 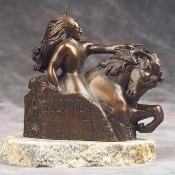 Mounted on polished granite blasted from the Mountain, the bronze (5.5" high) is obtained with a contribution of $1,500.00 to the nonprofit ©Crazy Horse Memorial Foundation (of which $1,100.00 is tax deductible under IRS rules). Made in the U.S.A.